Going to the Autosport show? 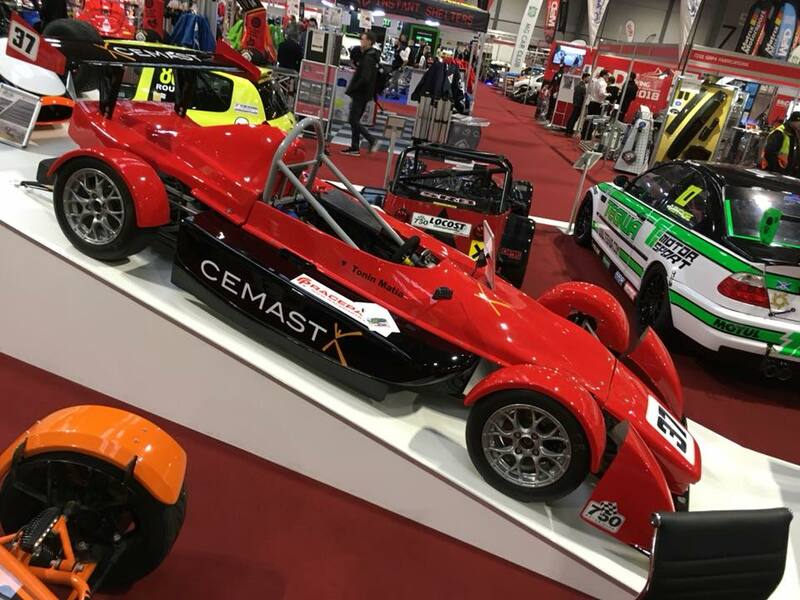 Ben and Ollie Collett will have their Racekits Falcon with their own design of carbon fibre bodywork on display on the 750 Motor Club stand. It is a fantastic piece of work and well worth seeing. Congratulations to Mark Glover for winning the 1st races for a Racekits Falcon and the 2018 750 Formula championship. A great result and a very popular winner. In the links section there is a link to Mark's blog of his building of the car from the kit. The season went less well for the works team with Andrew and me sharing the car. We had a number of minor reliability problems as we developed some the Mk 2 Falcon components but Andrew did get a fastest lap and a pair of 3rd places from 7th on the grid at Cadwell in his 1st wet race, while Mark was going on to win the 1st race for a Racekits Falcon. While Mark went on to another race win at Donnington I managed a couple of 4th places (should have been 3rds really). For the last race at Snetterton, father and son team Ben and Ollie Collett brought out their Falcon with all new and very impressive all-enveloping carbon-fibre bodywork which they have made themselves, and Ollie took it to a 3rd place finish. Over the winter we will be finishing off the modifications to complete the Mk 2 Falcon. The racing season has started at last. We have made some major upgrades to the Falcon since last year, but we hadn't finished them for the first race at Brands so the car was only cobbled together with some new and some old parts the night before the races. The car was running well in 4th place before succumbing to a blocked fuel line in both races. However Mark Glover in his Falcon had a good meeting leading the first race up till the last lap before being pipped for the win by reigning champion Bill Cowley. From the original drawings, Andrew has been building a chassis designed by Gordon Murray in the 1970's but never completed. Innovative for its time and very lightweight the chassis will be on display at Race Retro this week end. Andy and I will be there on the Friday so if you want see what Racekits can do for you or just have a chat with us please drop in. We are often asked which gearboxes to use with the Falcon or other transverse-engined 750 cars. On the Gallery page, I have put a table of the most commonly available gearboxes with the standard 5th gear ratio and also with the Ron Welsh 1:1 straight cut 5th gear which can be fitted without dismantling the main gearbox. One table gives the individual ratios and the other gives the overall ratios. For comparison I have also shown the overall ratios for a race Reliant gearbox with a 3.9 and a 4.2 final drive. The Grande Punto has a higher torque capacity than the earlier versions and is the one I have used in my Falcon since it was first built. Andy and I had a good time at the Autosport International show with plenty of interest in the very good looking Fareham College built Falcon. In the meantime we are developing a lot of improvements to our own car that can be incoroporated into future kits. I have added a link on the links page to Mark Glovers build blog that he wrote while building his own Falcon -the car in which Mark took 2nd place in the championship this year. The Fareham College built Rcaekits Falcon will be on display on the 750 MotorClub stand at the Autosport show. We have launched our new website - I hope it all works.